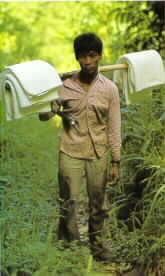 The pictorial essay below describes the life of a rubber tapper in a traditional rubber smallholding in Sarawak in the 1960's and 1970's. These smallholdings were remote from major towns. 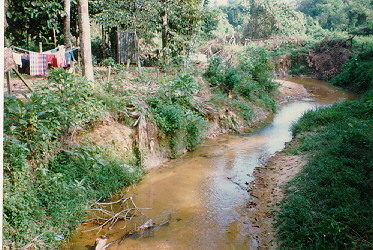 The methods used to tap the rubber trees, making and drying the rubber sheets were primitive when compared to the techniques currently used in large rubber plantations. 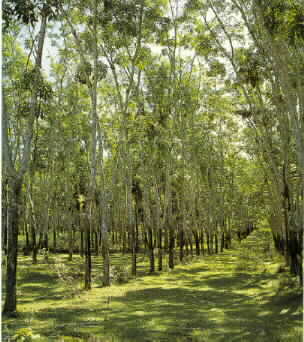 The rubber trees are grown in neat rows in small acreages by the owners. 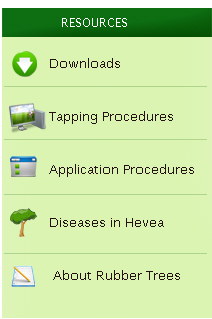 These are known as smallholdings. 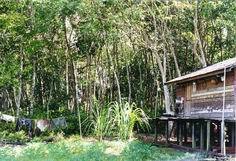 The owner's house is simple wooden house at the fringe of the rubber smallholding with no basic amenities as it is far away from populated areas. 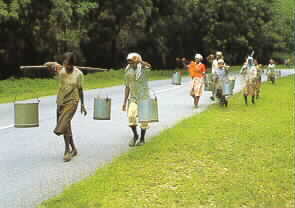 As a result, the tranquillity of rustic village life is acutely palpable. It is something that an urbanite may never get to experience! Rubber tapping is hard work. It can starts as early as 2 am. The coolness of the early morning air encourages the latex to flow thus improving the yield. 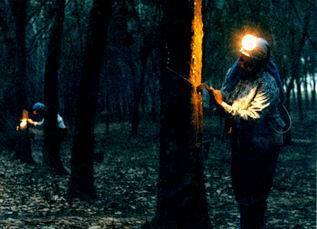 However, the tapping will continue until late morning. 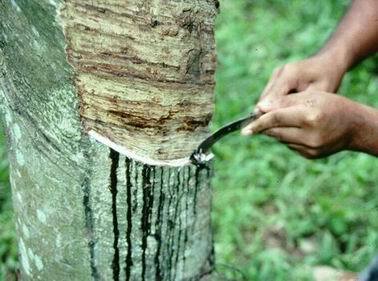 A special tapping knife is used to shear off a thin layer of rubber tree's bark. Care must be taking not to cut too deep as this would injure the tree. 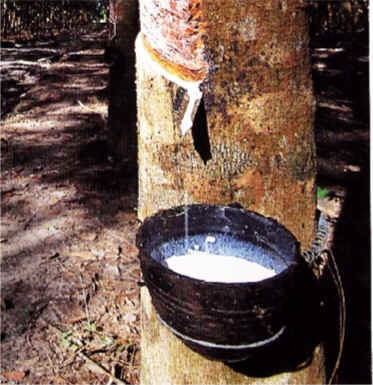 The latex flows into the cup attached to the tree. By noon or early afternoon, the latex will have stopped flowing. 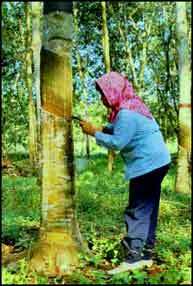 The rubber tapper will then go back to each tree and empty the latex collected in the cups into the tin. 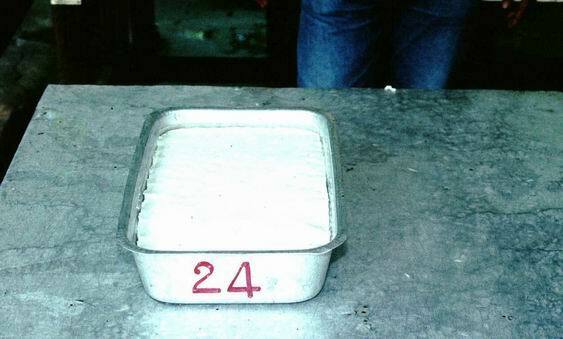 The tins of latex will be carried back to a small makeshift rubber "factory" in the smallholding. 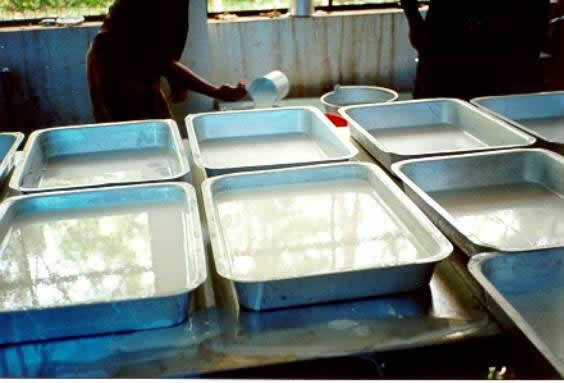 Here the latex is poured into moulds. Then formic acid is added to coagulate the liquid latex. This transforms the liquid latex into a firm solid block of rubber. The block of rubber is initially rolled using a wooden roller so that it is thin enough for it to be rolled by the mangle machine. This is a picture of the mangle machine. 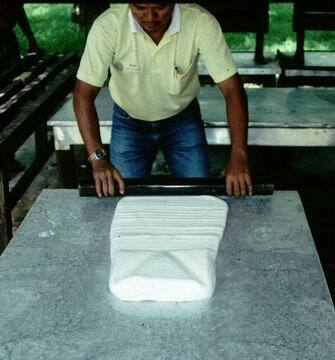 It is the only piece of machinery required to make the rubber sheets. 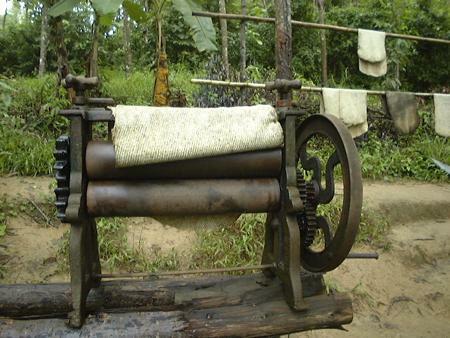 The rubber sheet is manually rolled using the mangle several times to make it thinner by squeezing out the water. This make it easier for the sheet to dry. 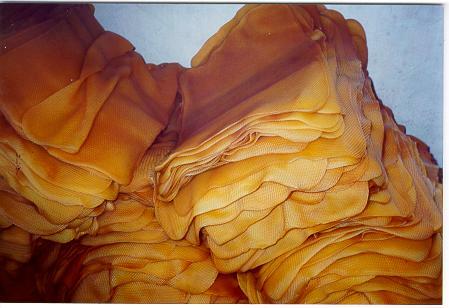 The finished rubber sheets are then bought home for drying. Normally, the drying takes place in a "smoke" house but often it is just air-dried underneath the house. 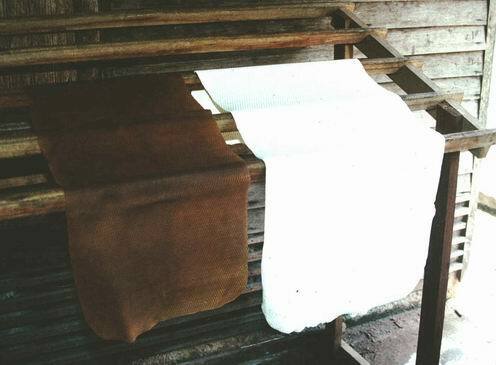 The dried rubber sheet is golden brown as opposed to white initially. Here, the dried rubber sheets are stacked up waiting to be sold to the middlemen.